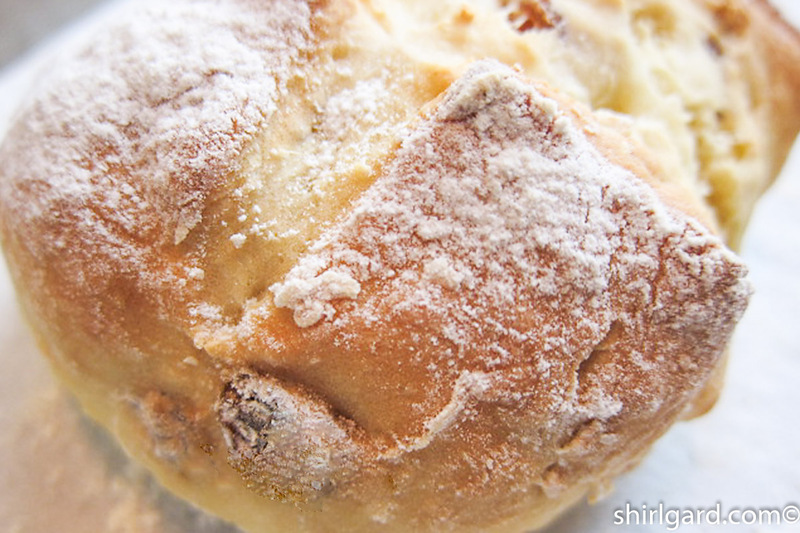 Everything that I have read about traditional Irish Soda Bread and its beginnings points to a very spare and frugal recipe consisting of only four ingredients: flour, baking soda, salt, and buttermilk. This bread, because of its frugality, was popularized by necessity in the mid-19th century during the great famine in Ireland, when the potato crop failed. 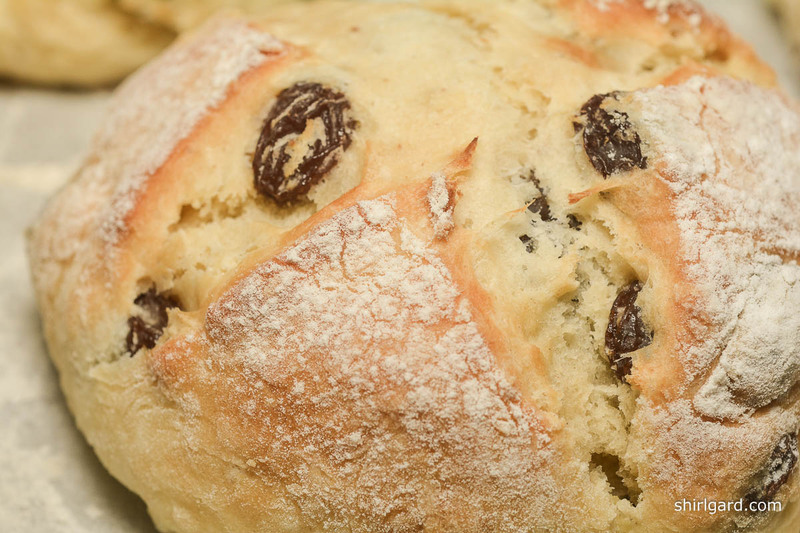 There has always been a debate about whether Irish Soda Bread that includes other ingredients such as butter, sugar, raisins, caraway seeds etc. can be considered “traditional”. Apparently not, according to The Society for the Preservation of Irish Soda Bread, where they say on their home page: “Flour, Salt, Baking Soda, Buttermilk. Anything else added makes it a ‘Tea Cake’”. 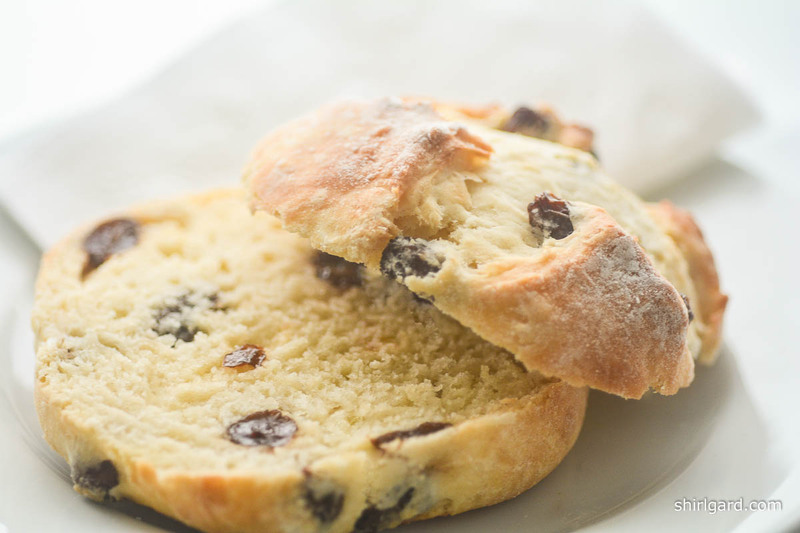 According to this definition, many American and Irish versions of Irish Soda Bread, fall into the Society’s “Tea Cake” category, but that’s OK; they are nevertheless delicious for breakfast, brunch, or snacking. 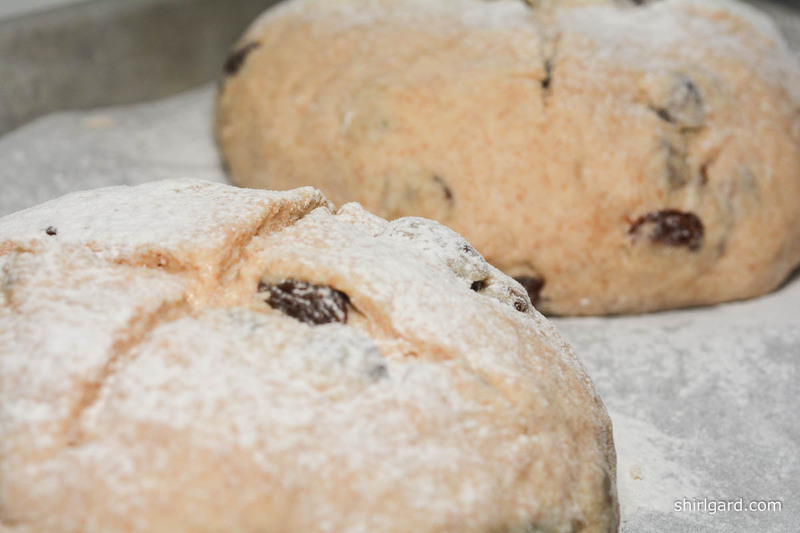 Whether “traditional” or of the “tea cake” variety, we tend to put all Irish Soda Breads in the “Quick Breads” category because they are made with baking soda, not yeast, and soft wheat flour instead of hard. What’s “traditional” and what’s not can be a little confusing. To get a little more insight, I started reading my old copy of Darina Allen’s Ballymaloe Cooking School Cookbook (2002), (Ballymaloe, Ireland) which is where I always go when I want information on Irish cooking and baking. This book contains both “traditional” and very amusingly descriptive variations (from “Spotted Dog” to “Seedy Bread” to “Spotted Puppies”). 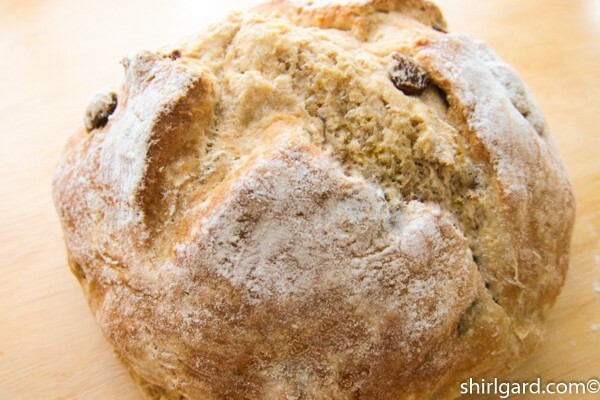 Reading these names made me smile and inspired me to write this story, bake some Irish Soda breads, and create a Glossary of Irish Soda Bread jargon. One final tip that I picked up from Darina Allen’s book: “Place the dough on a baking tray dusted lightly with flour. With a sharp knife, cut a deep cross on it, letting the cuts go over the sides of the bread. Prick with a knife at the 4 angles as, according to Irish folklore, this is to let the fairies out!”. As to why it’s important to mark the bread with a cross and “let the fairies out”, edible-ireland.com explains: “Superstition says that bread marked with a cross wards off evil, but the Irish slant is that it protects it from the fairies, who were liable to jinx your baking”. All of this talk of “crosses” and “fairies” makes me smile too. Let’s bake some Soda Bread, and please, let’s “ward off evil” and not tempt the fairies. Brown Soda Bread—According to Allen’s book, this is made with half white flour and half whole wheat flour. Otherwise, it follows the “traditional” formula of the four basic ingredients. Other sources give different proportions of white and whole wheat flour to use, according to preference. The more whole wheat flour, the heavier the bread; the more white flour, the lighter the bread. Another name for Brown Soda Bread is “Wheaten Bread”. Farls—Literally, this means “Fourths”. 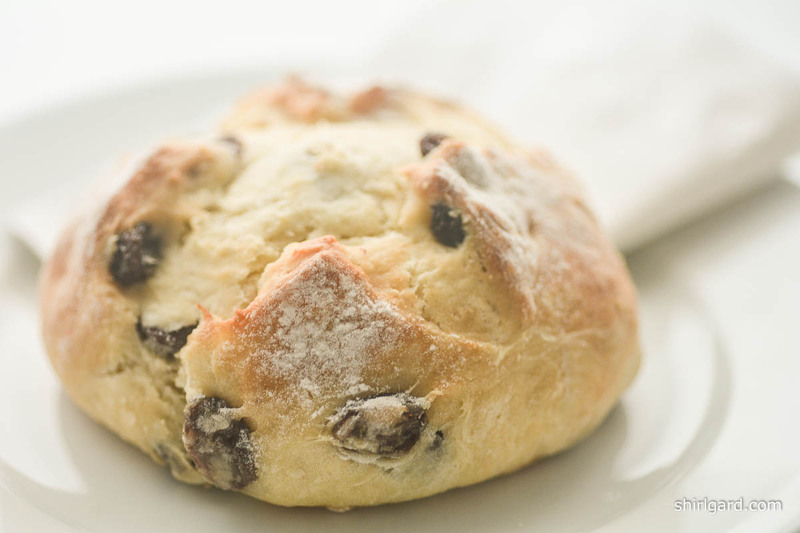 Made from the same four “basic” Irish Soda Bread ingredients, the finished dough is shaped into a flat round, cut into quarters, and cooked in a skillet on a smattering of flour. This might also be referred to as “griddle bread” as it can be also be cooked on a griddle. It is meant to be a “daily bread”. 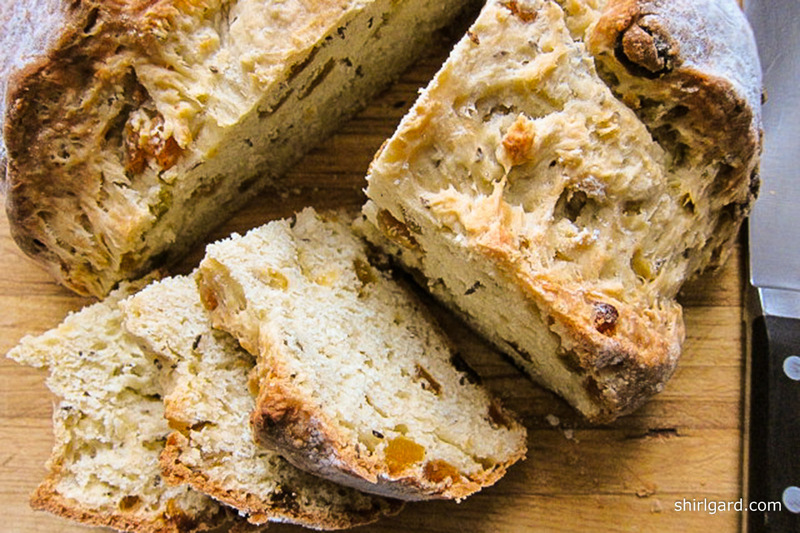 Golden Soda Bread—Approximately 1/3 of the flour (1 cup) in the “traditional” recipe is replaced with yellow cornmeal. 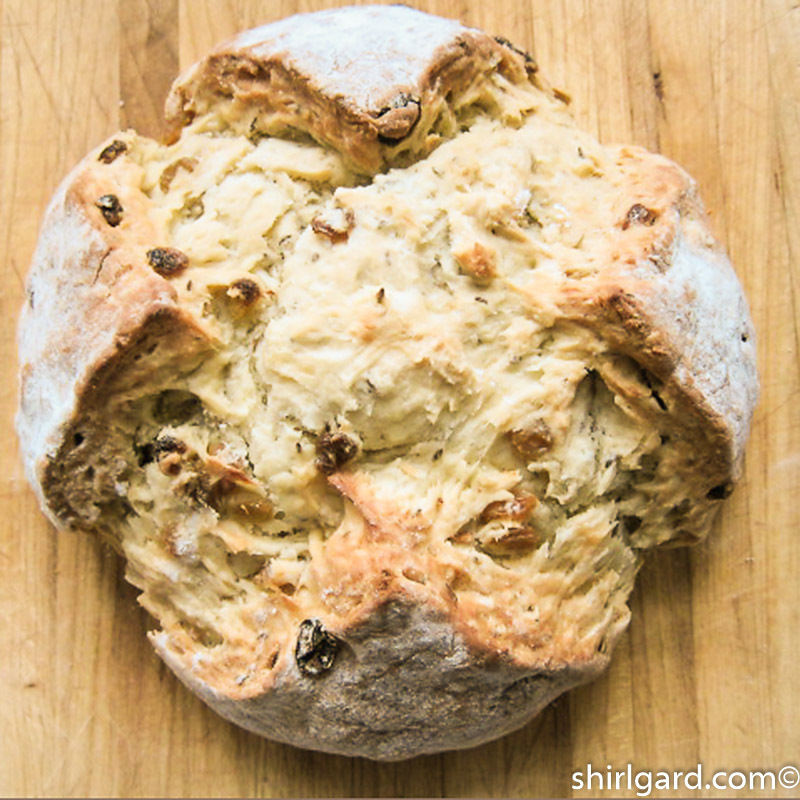 Irish-American Soda Bread—This is my name, but a good name I think, for all those recipes out there that are loaded with raisins, other dried fruit, caraway seeds, butter, sugar etc. 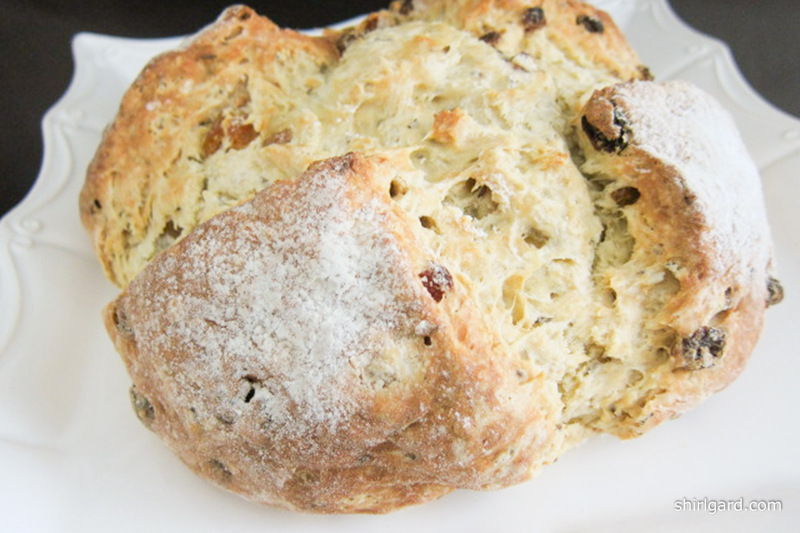 that claim to be Irish Soda Bread but, in fact have been “Americanized”. According the Society, this is the “Tea Cake” variety of Soda Bread. According to American definition, Soda Bread falls into the “Quick Bread” category. 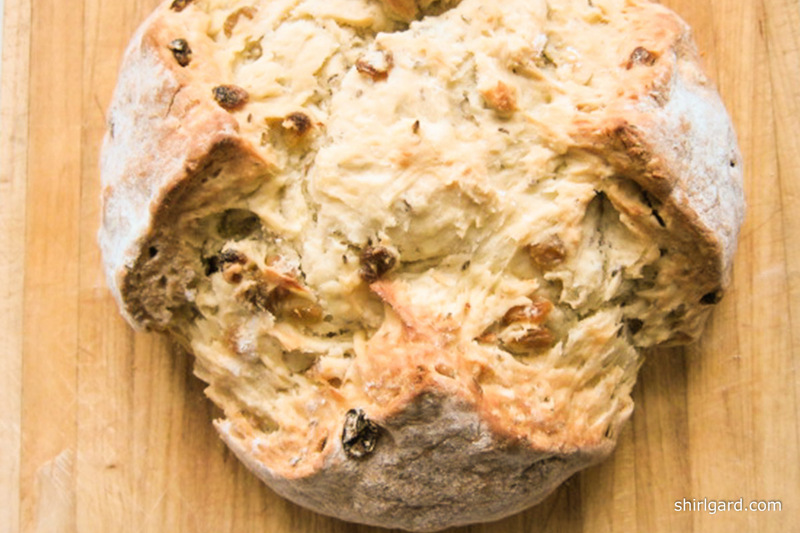 Although you do see Irish versions of Soda Bread with these additions, American versions go further with “add-ins” because we tend to think of soda bread as a breakfast bread or as a snack bread and not as a “daily bread”. From an American-palate point of view, this doesn’t make them bad; it makes them very good. They just aren’t “traditional”. 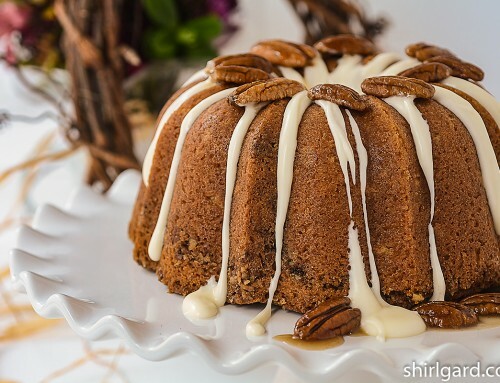 This is the variety that I prefer, because the addition of just a little butter and a little sugar adds the moisture needed for better texture and keeping qualities, as well as better flavor. My base recipe comes from this genre. 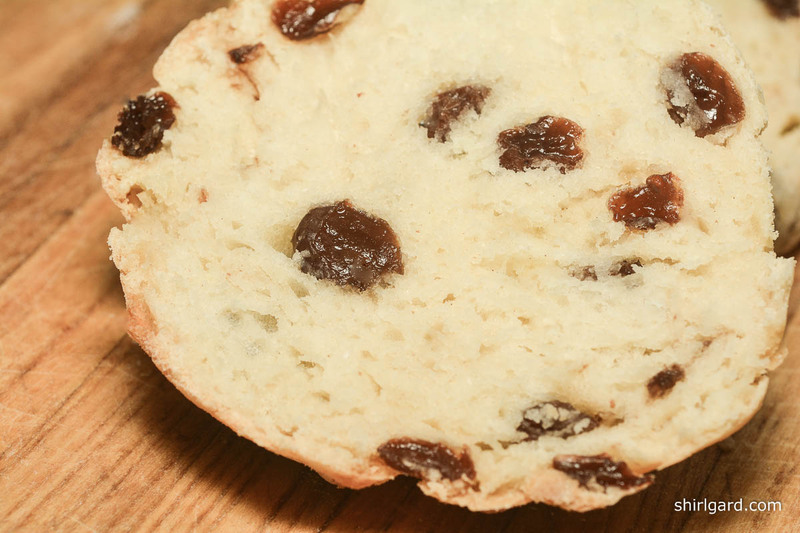 Railway Cake—Another name for “Spotted Dog”, which is used in some parts of Ireland, when dried currants are added to the basic recipe: “a currant for each station”. Rich Brown Soda Bread—This partially whole wheat dough is enriched with a little butter and sugar (or egg), with maybe even a small amount of oatmeal added. 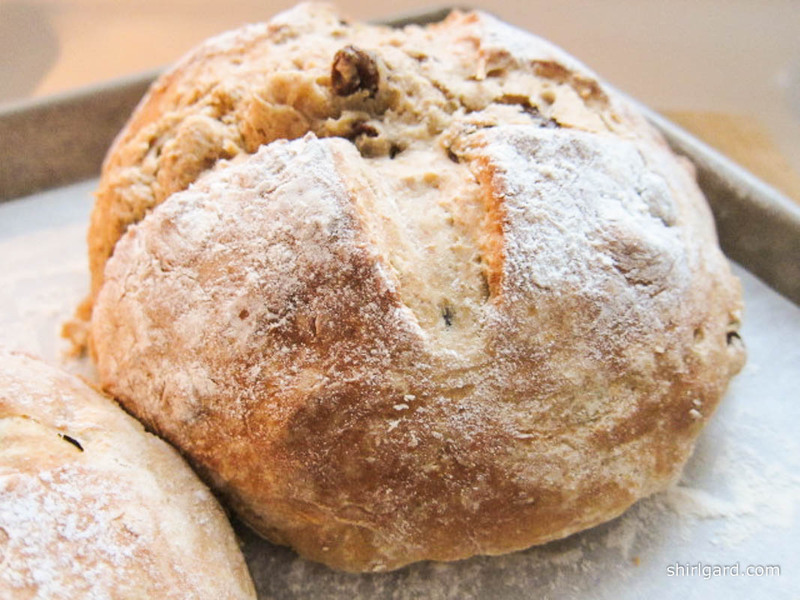 Seedy Bread—This is a variation on the “traditional” Irish Soda Bread. In addition to the four basic ingredients of flour, salt, soda, and buttermilk, “Seedy Bread” also contains caraway seeds and a little sugar. Darina Allen says it is “delicious when served for afternoon tea”. 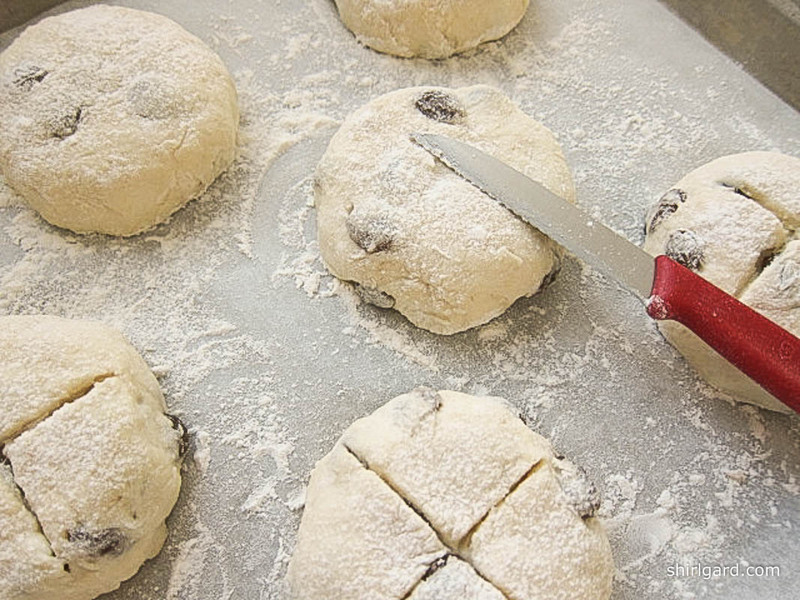 Soda Scones—Same dough as “Traditional Irish Soda Bread”, “Brown Soda Bread” or any other version of Soda Bread dough, but rolled out to a thickness of 1 ¼” – 1 ½”, then cut out with a round cutter (or cut into squares) and baked. 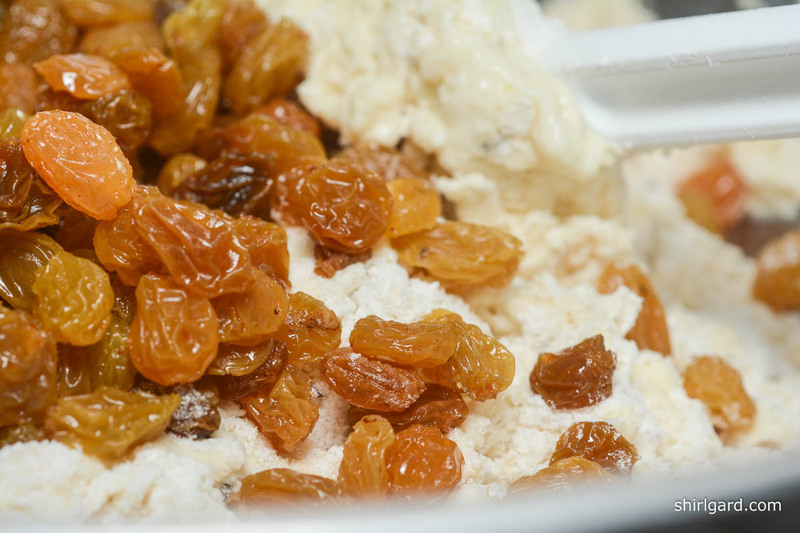 Spotted Dog—The “spots” in “Spotted Dog” are golden raisins (Sultanas) added to the basic four ingredients, along with some butter, eggs, and a little sugar. For more definitive “spots”, use dark raisins. Spotted Puppies—I love this name and I love making these. 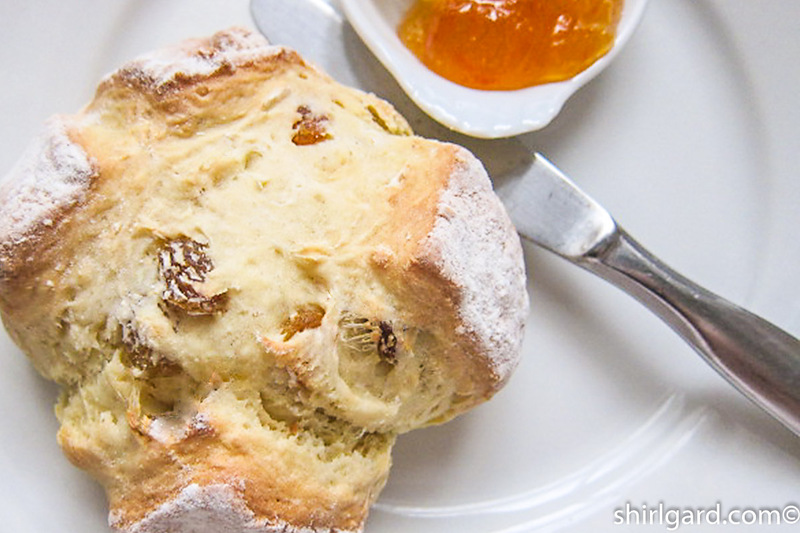 They are small individual Soda Breads (so cute), similar to large scones, made with the same recipe as “Spotted Dog”. Again, dark raisins make for better “spots”. Stripy Cat—This is like “Spotted Dog”, except roughly chopped chunks of chocolate are added to the basic recipe instead of raisins. This concept comes from the Allen book. 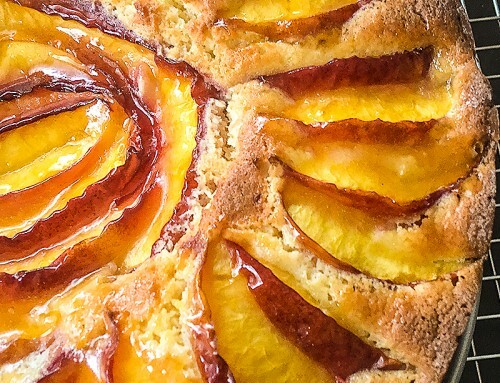 This recipe is best when consumed shortly after being baked, as it was originally intended, when it was baked almost every day: a “daily bread”. Treacle Bread—Sweetened lightly with molasses (treacle) and flavored with a pinch of ground ginger, this is a soda bread that falls into “Tea Cake” territory. Wheaten—Another name for Brown Soda Bread. Here’s how to make “Spotted Puppies”. 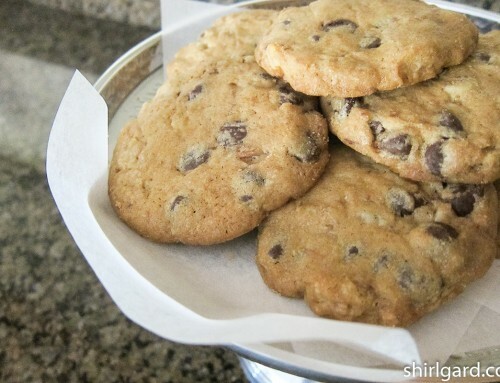 The first time I made these I used golden raisins, but the “spots” didn’t show up enough, so I switched to dark raisins. I just couldn’t get 101 Dalmatians out of my mind. Cutting a deep “cross” (at least a 1/2″ deep and almost to the edges) on top of the rounded dough yields a loaf that “opens up” like a flower. If you want a more compact loaf that doesn’t “open up” as much, cut the “cross only 1/4” deep, like the Brown Soda Bread below. VARIATION #3: BROWN SODA BREAD WITH DARK RAISINS -This version, using part whole wheat flour, makes two smaller loaves. 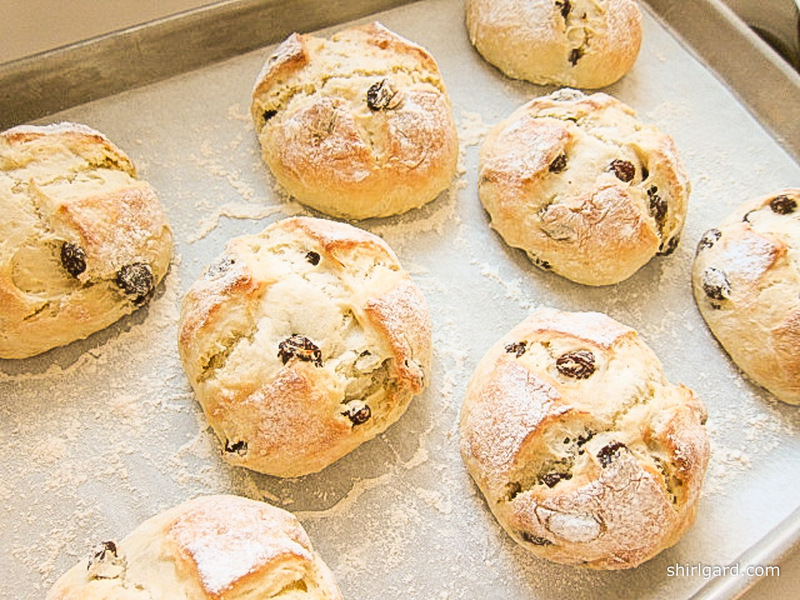 This is an Irish-American version of Soda Bread. Just adding a small amount of butter and a smidge of sugar does a lot for texture and flavor. My preferred blend of flours for the soft wheat flour needed for Soda Bread is 50% unbleached all-purpose flour and 50% pastry flour. 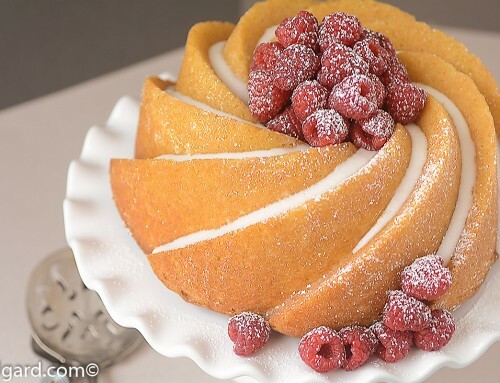 As an alternative, you can use 75% unbleached all-purpose and 25% cake flour or 100% bleached all-purpose flour. 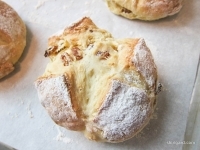 My favorite version of Irish Soda Bread is "Spotted Puppies", which are small individual scone-like breads. I give three variations here: one for the "Puppies"(with dark raisins), as well as a large round loaf version (with caraway seeds and golden raisins) and a version for two small round loaves (using part whole wheat flour and dark raisins). 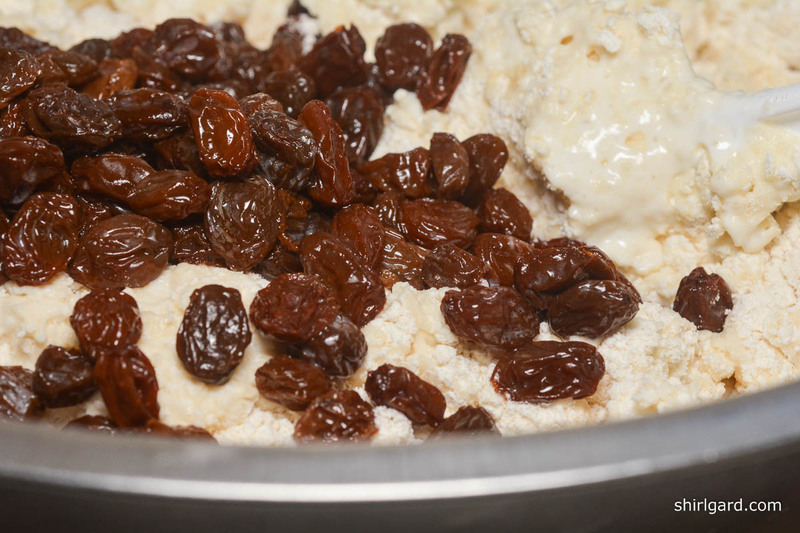 - Plump the raisins in a light sugar syrup: Bring ½ cup water and 2 T sugar to a boil and pour over raisins. Cover and let steep 30 minutes. Drain and pat dry. 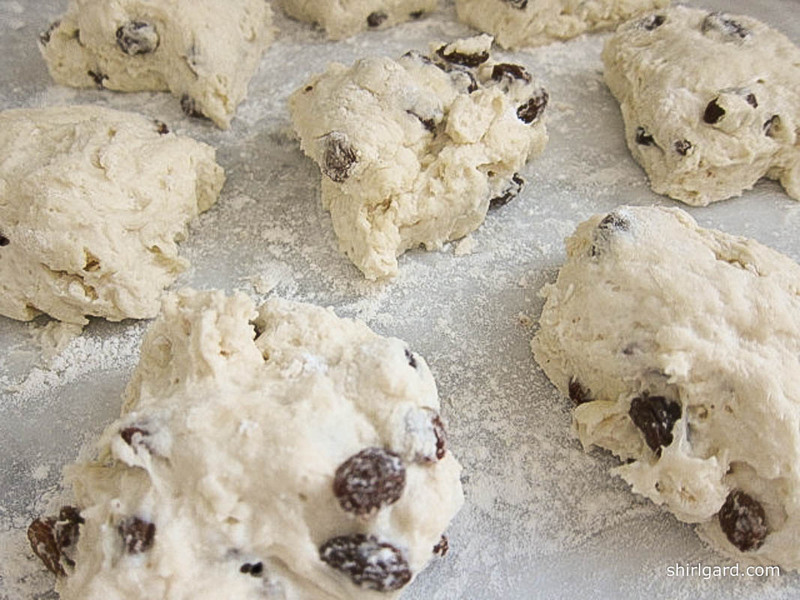 - Or: Microwave water, sugar, and raisins for 1 minute on high. Cover and let steep 30 minutes. Drain and pat dry. Preheat oven to 425° F. For "puppies", line one half-sheet pan with parchment paper and sprinkle lightly with flour. For loaves, line one quarter-sheet pan with parchment paper and sprinkle lightly with flour; double-pan for loaves. Combine the dry ingredients in a large mixing bowl. Whisk well to mix. Rub in the butter until mixture is like crumbs. Pour the buttermilk on top of the dry ingredients, and fold gently with a rubber spatula until the flour is half-absorbed. 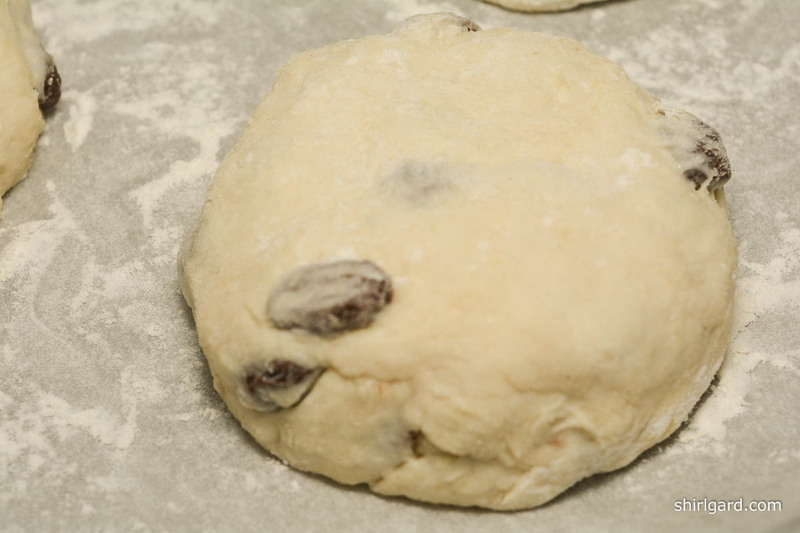 Scatter the raisins over the top of the dough and finish folding in. Remove the dough from the bowl and place on a lightly floured work surface. VARIATION #1: FOR SMALL INDIVIDUAL BREADS - "SPOTTED PUPPIES" WITH DARK RAISINS Omit optional caraway seeds and use dark raisins. 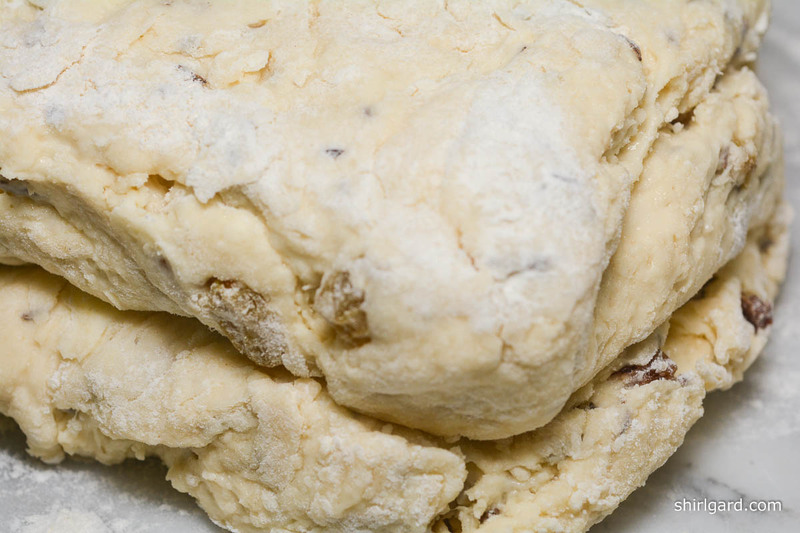 DIVIDE AND SCALE the dough into 8 pieces - 135 grams (4¾ oz) each. With floured hands, fold each piece in half and then in half again; round up each piece into a smooth tight ball. Place on prepared half-sheet pan (3-2-3) and pat gently to 3" rounds. Dust the tops lightly with flour,using a small sieve. With a sharp serrated paring knife, cut a cross (+) on the top of each. Bake immediately. BAKE @ 425°F for about 20 minutes, rotating the pan half way through baking, until golden brown. If using a probe thermometer, insert after 15 minutes: the internal temperature should register 209°F. Cool on a rack. VARIATION #2: ONE LARGE "SEEDY BREAD" LOAF WITH GOLDEN RAISINS (OR: "SPOTTED DOG" WITH CARAWAY SEEDS) Add the optional caraway seeds and use golden raisins. FOR ONE LARGE ROUND LOAF: The finished dough will weigh about 1100g (2# 6 oz). 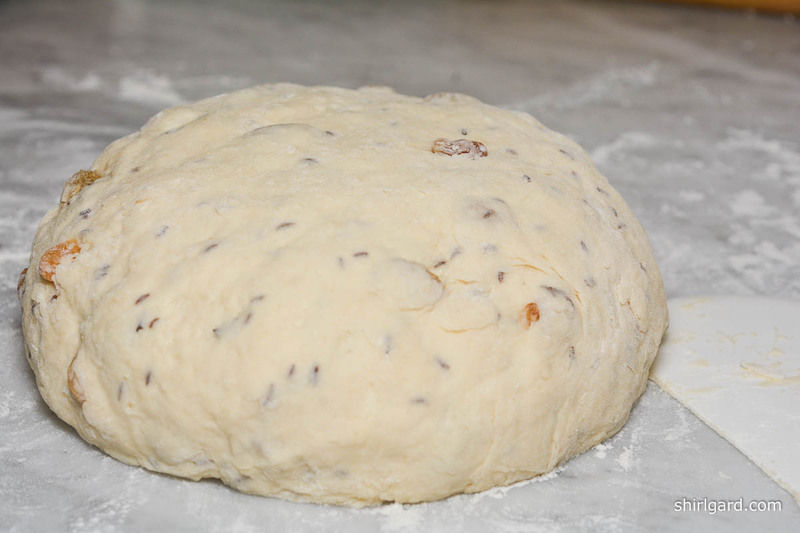 Pat the dough into a round about 1" thick. 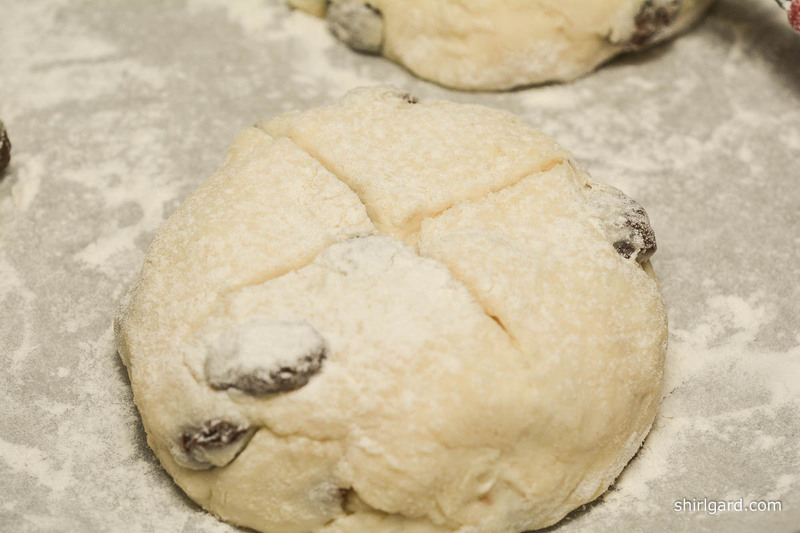 Fold the dough in half and then in half again. 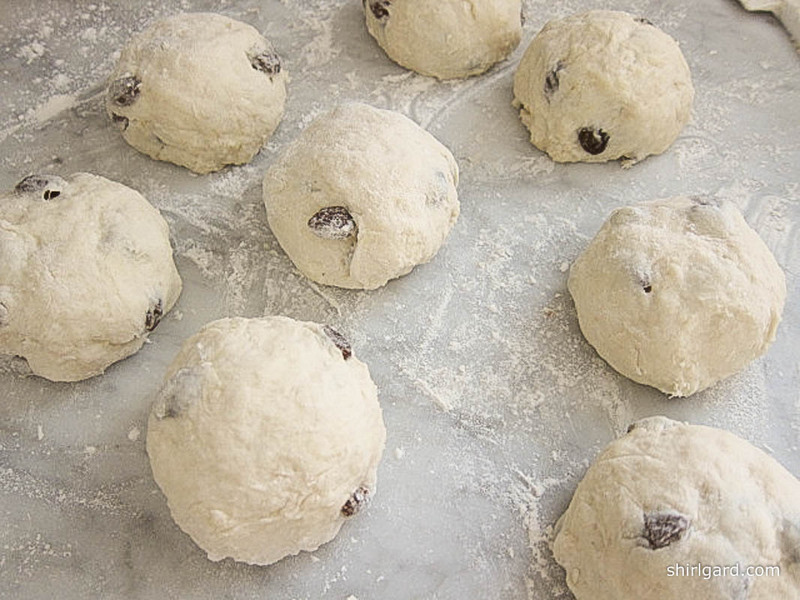 Round up and form the dough into a smooth tight ball. Place on prepared quarter-sheet pan and flatten slightly to 6½" round. Dust the top very lightly with flour, using a small sieve. With a sharp serrated paring knife, cut a cross (+) about 5 inches long and ½ inch deep into the top of each loaf. Bake immediately. BAKE @ 425°F for 15 minutes. Turn oven down to 375°F and bake for 10 minutes. Rotate the pan and turn the oven down to 325°F to finish baking, another 25 - 30 minutes until golden brown and the internal temperature registers 209°F. Total baking time 50 - 55 minutes. If at any time, the bread looks too dark place a foil tent over the top to prevent further browning. 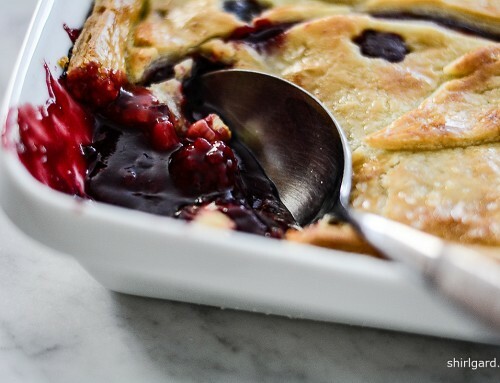 if using a probe thermometer, insert it after 45 minutes of baking when the crust is fully formed. For flour, use 270 grams pastry flour (2 cups) and 180 grams whole wheat flour (1¼ cups). This is a 60% / 40% blend. Omit optional caraway seeds and use dark raisins. 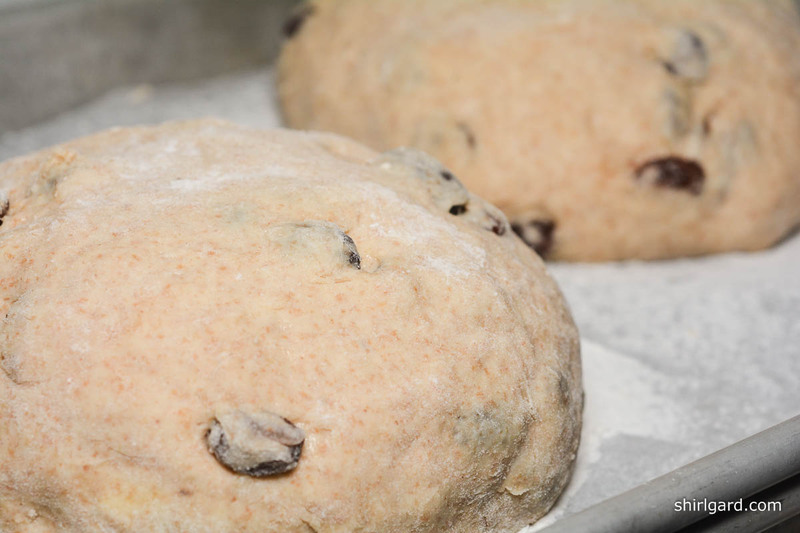 FOR TWO SMALL ROUND LOAVES: DIVIDE AND SCALE the dough into two 560 gram (1# 3 oz) loaves. 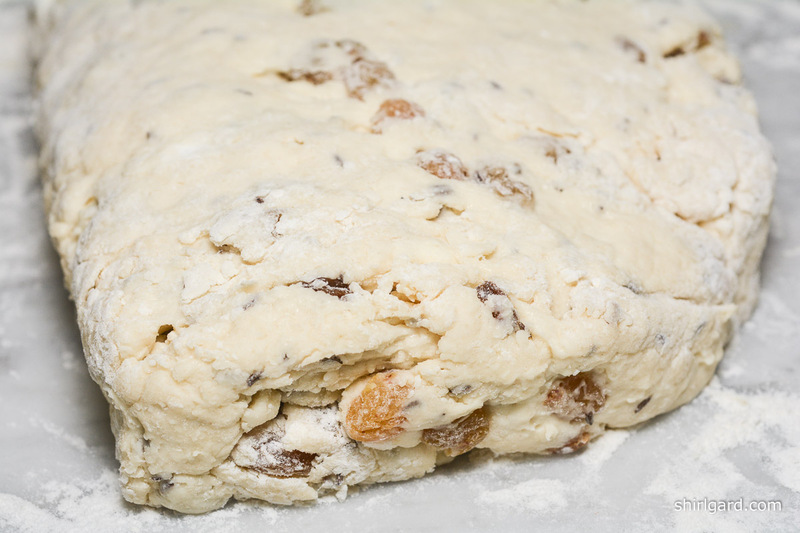 Proceed as above for one loaf, except the dough rounds should be shaped to about 4½" in diameter. Cut the cross (+) on top 3" long and ¼" deep. BAKE @ 425°F for 15 minutes. Turn oven down to 375°F for 10 minutes. Rotate pan and insert probe thermometer. Turn oven down to 325°F to finish baking, another 20 minutes. Total baking time is about 45 minutes. Internal temperature = 209°F. The proportions in this recipe were adapted from the "Seedy Bread" variation of Irish Soda Bread in Nick Malgieri's How to Bake (1995). The concept of "Spotted Puppies" and "Spotted Dog" come from The Ballymaloe Cooking School Cookbook by Darina Allen (2002).